I used Be Thankful Bundle and Weathered Wood stencil. Apple basket is colored with Distress Inks. Fabulous creation, such great texture! 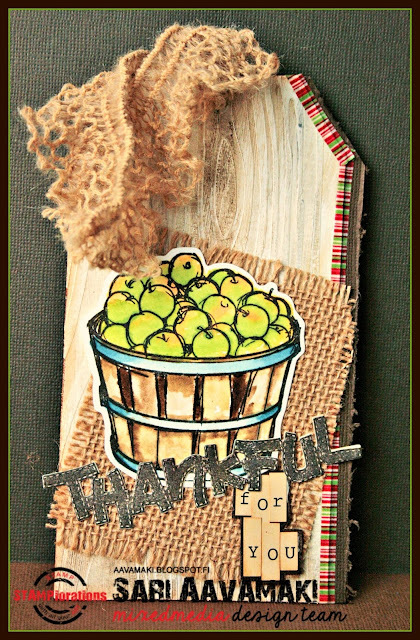 Thank you for playing along with us at Sweet Stampin’ this week. This is fantastic - love all the different textures you have used. Beautiful tag! Love the burlap on there!! Very pretty! Awesome tag! I love the textures.Thanks for joining us at Happy Little Stampers! Very creative... and pretty! Thanks for playing along at Sweet Stampin' Challenges! What a fab rustic tank you tag, love the stitching on the die cut sentiment.